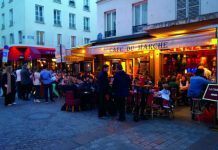 Famed especially for its pâtisserie, the Rue Montorgueil is a magnet for food lovers. Like so many flâneurs before and after him, France’s father of literary realism, Honoré de Balzac, spent a lifetime walking the streets of Paris, drawing inspiration from the cobblestones and the human spectacles he saw played out in boutique windows, street markets, and cafés. And like all lovers of Paris, Balzac was sometimes frustrated by how rapidly this city can evolve, how entire quartiers can become unrecognisable overnight. 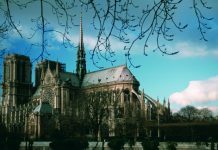 He knew how it feels to wander Paris searching for that single street, that single restaurant, that single meal, which might allow you to taste the essence of the city again – and how delicious it feels when you finally do. “Ah, to find Paris again! Do you know what that means, dear Parisians? 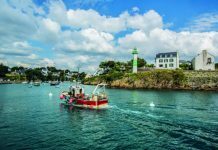 It is to find… the cuisine of the Rocher de Cancale, as prepared by Borel for gourmets so lucky to appreciate it, for it only exists on Rue Montorgueil.” So reads Balzac’s 1843 novel Honorine, part of his sprawling masterpiece, La Comédie humaine. 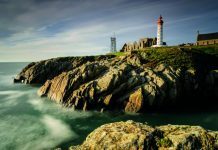 Balzac would never have exaggerated about food, so the Cancale, which was adored by 19th-century literati, must have boasted transcendent cuisine indeed. Alas, we can only guess what dish it was that so encapsulated Paris for Balzac. Was it the Sole Normande, the iconic recipe said to have been invented here in 1837? Or perhaps the famous Cancale oysters, considered by some the finest in Europe? Balzac was known to eat 100 at a go. Whatever it was for Balzac, everyone has a dish that draws them to Rue Montorgueil. 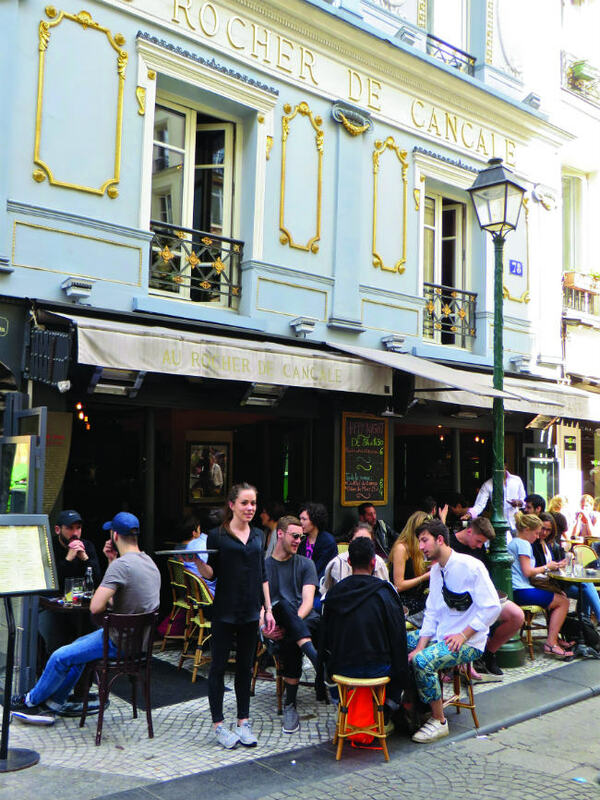 For generations of gourmets, bons vivants and connoisseurs of colourful characters, Rue Montorgueil has been one of those rare roads where one’s appetite is always met. Today still, this pedestrian market street, stretching from Rue Réaumur down to the Forum des Halles, has retained its gastronomic character long after the closure of the giant central food market to which it once led. With butchers, fishmongers, produce stands and confectionery shops, “Quartier Montorgueil is one of the last food-oriented neighbourhoods in Paris where you can still find a bit of everything,” says Jean-Christophe Valy, manager of the delicatessen and pastry supply shop G. Detou, a 65-year-old institution whose name means ‘I have everything’. 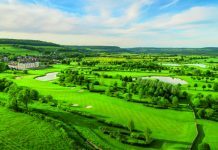 Chefs and foodies from around the world come here to buy baking chocolate, pistachio paste for entremets and macarons, praline for flavoured ganaches, and Breton sardines in salted butter, Périgord foie gras and smooth Pommery mustard. 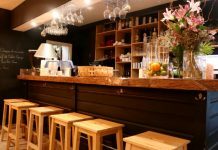 But while many come to Rue Montorgueil to tickle their palates, others revel in the vestiges of centuries past, savouring the piquant anecdotes that every building and side street evokes. 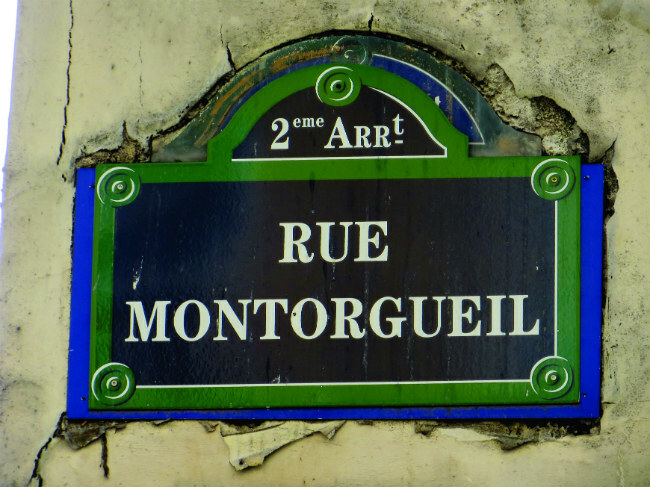 Rue Montorgueil took its name in the 13th century from the hill it ascends – Mont Orgueilleux, or ‘Proud Mountain’. Its history really begins in 1183 when King Philippe Auguste created the central Paris marketplace, later known as Les Halles. A large shelter was built for the vendors to sell their wares, and soon merchandise was arriving by donkey and horseback from all across France. As the principal artery to Les Halles from the north, Rue Montorgueil became road’s end for fish and oyster merchants from the whole north-western coast. The Société des Huîtres d’Etretat, created in 1777 to satiate Marie-Antoinette’s appetite for oysters, set up at 61-63 rue Montorgueil. 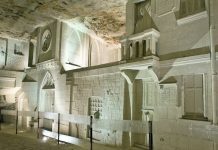 From the late 1700s until 1866, an entire parc à huîtres, where live oysters were kept in basins, was situated at the corner of Rue Mauconseil and Rue Montorgueil. Alongside the oyster merchants opened numerous auberges, cabarets and restaurants. 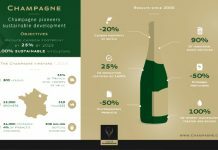 In 1804, Le Rocher de Cancale opened at 59 rue Montorgueil, before moving in 1846 to a 17th-century building at 76 rue Montorgueil. In 1838, a journalist from Bentley’s Miscellany of London ranked the greatest restaurants in Paris. “Among these Rocher is said to tower supremely,” he wrote. Today, the institution’s formerly crumbling wood and plaster façade has been restored, though its carte (now mainly burgers and salads) is humbler than it was. Nevertheless, their Cancale oysters are still supremely fresh. 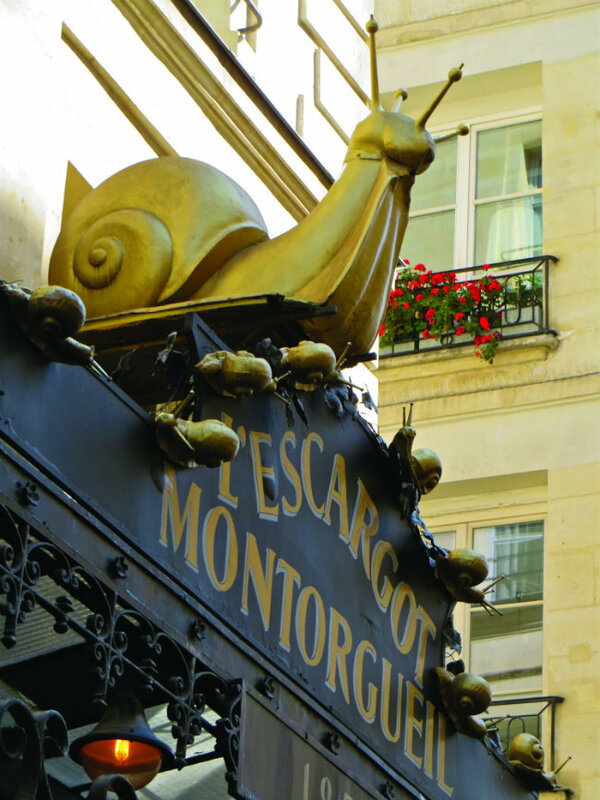 The only restaurant to rival the Rocher’s fame brought another celebrated mollusc to the street, L’Escargot Montorgueil. A host of the greatest names in art and theatre would file under the giant golden snail out front – Sarah Bernhardt, Marcel Proust, Charlie Chaplin, Jean Cocteau, Pablo Picasso, Salvador Dalí… The interior’s Second Empire décor is stunning, as is the spiral staircase ascending to an upstairs salon. The ceiling painting by Georges Clairin in the restaurant’s entry once graced the ceiling of Sarah Bernhardt’s dining room. Doubtless there’s no greater temple to l’escargot bourguignon. Lovers of the delicacy will savour them prepared traditionally with garlic and parsley butter, but also with foie gras, truffles or even flakes of 24-carat gold. 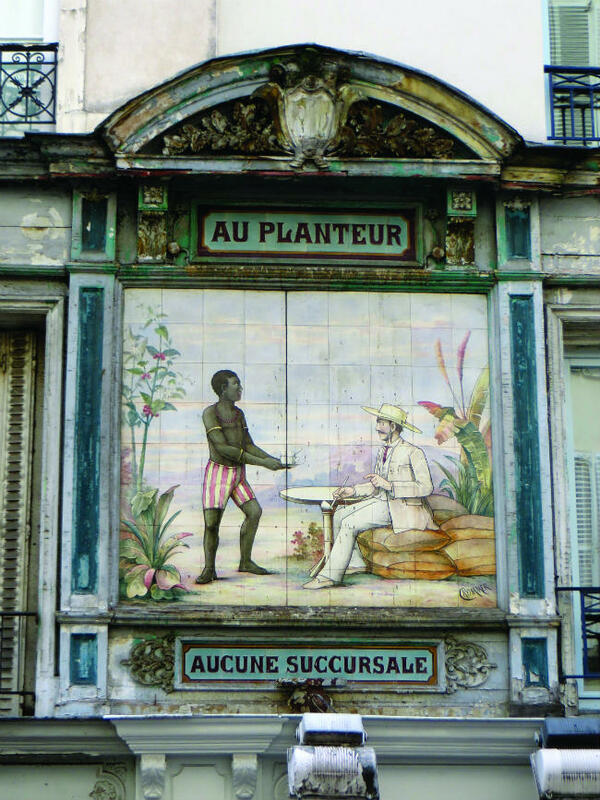 At the northern entrance to Marché Montorgueil, a 19th-century ceramic sign at 10 rue des Petits-Carreaux catches your attention. Labelled ‘Au Planteur’, the sign once advertised a boutique that sold products from the French colonies. The scene depicted is shocking to modern eyes: a shirtless black man serving coffee to a seated white man in colonial attire. 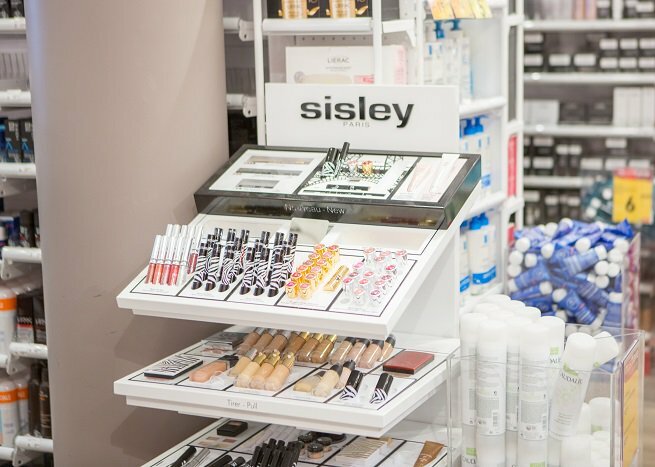 Below, the words “aucune succursale,” indicate that this was the only shop in Paris to carry such products. Today, it’s finding such visual traces of France’s colonial past that’s rare. It was another imported delicacy that established the fame of the oldest pastry shop in Paris, Pâtissier Stohrer. In 1725, when Marie Leszczynska, daughter of King Stanislas of Poland, married Louis XV, she brought her pastry chef, Nicolas Stohrer, to Versailles. 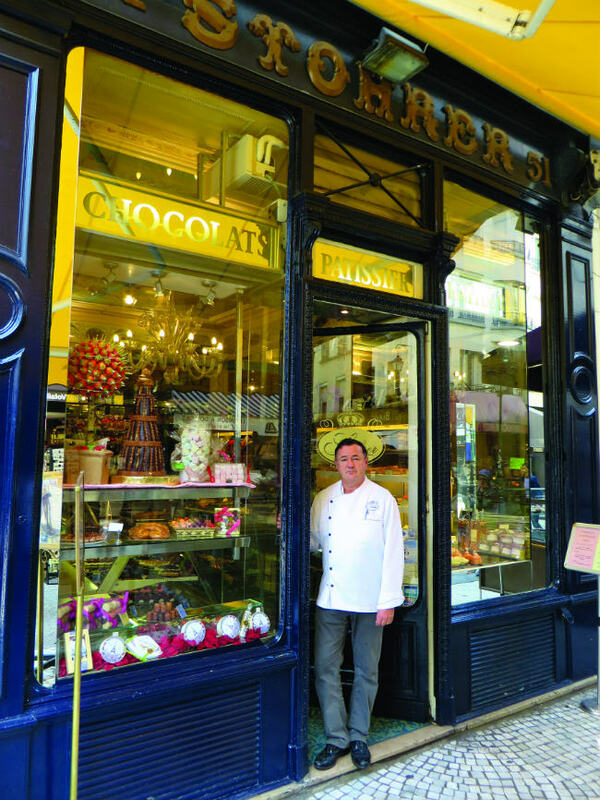 Five years later, Stohrer opened his bakery on Rue Montorgueil. 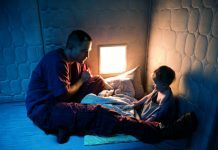 Apparently, it was a dried-out Polish brioche that inspired Stohrer’s most famous dessert. He moistened it with Malaga wine and flavoured it with saffron, pastry cream, grapes and dry currants. Les Mille et une nuits (Arabian Nights), was all the rage and the dessert was named for the character Ali Baba. 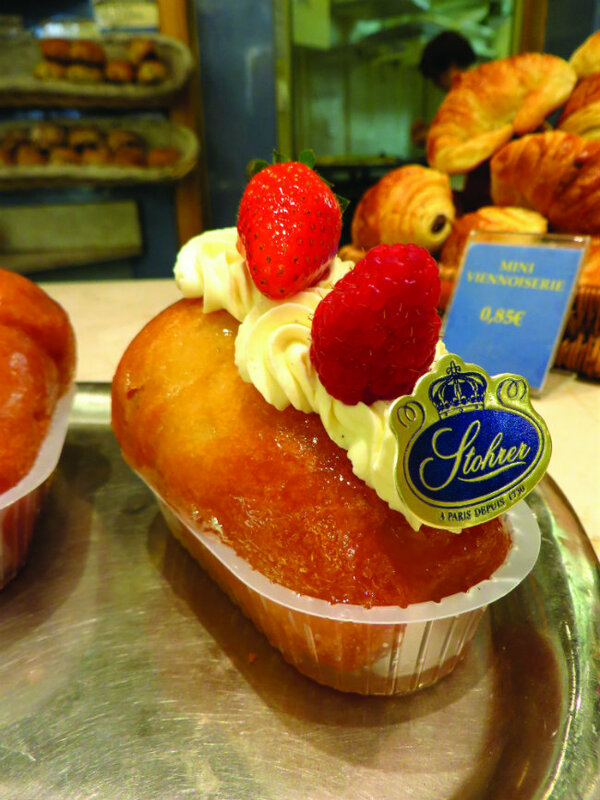 A century later, in 1835, Stohrer’s descendant and namesake tweaked the recipe, replacing the wine with rum, thus creating the modern Baba au rhum. Today, pastry lovers step into Pâtisserie Stohrer as if onto hallowed ground, marvelling at the beautiful 1864 murals. And after tasting such classics as Stohrer’s magistral Religieuse au Chocolat, the delicate Mille-feuille au caramel, or the divine Baba, many continue just a few doors down the street, where they jump from the 18th century straight into the 21st. Fou de Pâtisserie is a pioneering pastry shop, dedicated to the creations of France’s pastry avant-garde. “La pâtisserie in France is undergoing the revolution that took place in cuisine in the 1980s,” says co-founder Julie Mathieu. “There’s an absolutely incredible burgeoning of creativity.” Every morning, pastries arrive from a dozen chefs across France – salted butter éclairs by Christophe Adam, red currant and Sicilian mandarin cheesecakes by Philippe Conticini, macarons by Pierre Hermé. 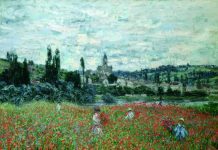 Mathieu could have launched her boutique on luxurious Place Madeleine, but she never imagined any place but Rue Montorgueil. 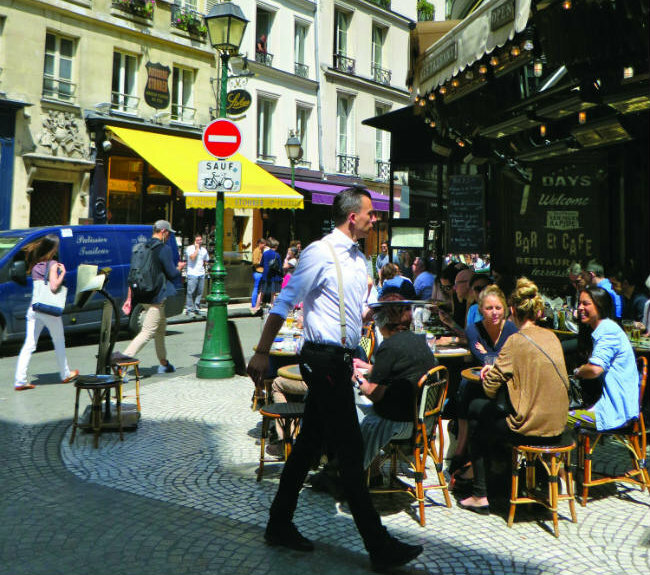 “This is a real quartier de bouche and a pedestrian street, and not a lot of those remain in Paris. 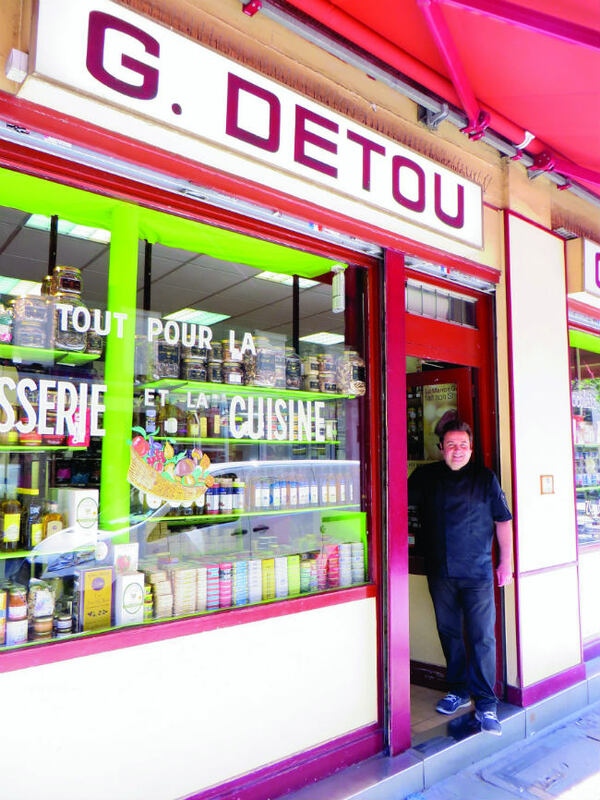 People do their shopping here because there are true artisan shops, like our butcher across the street, Au Boeuf du Cantal (54 rue Montorgueil), which is almost a century old. 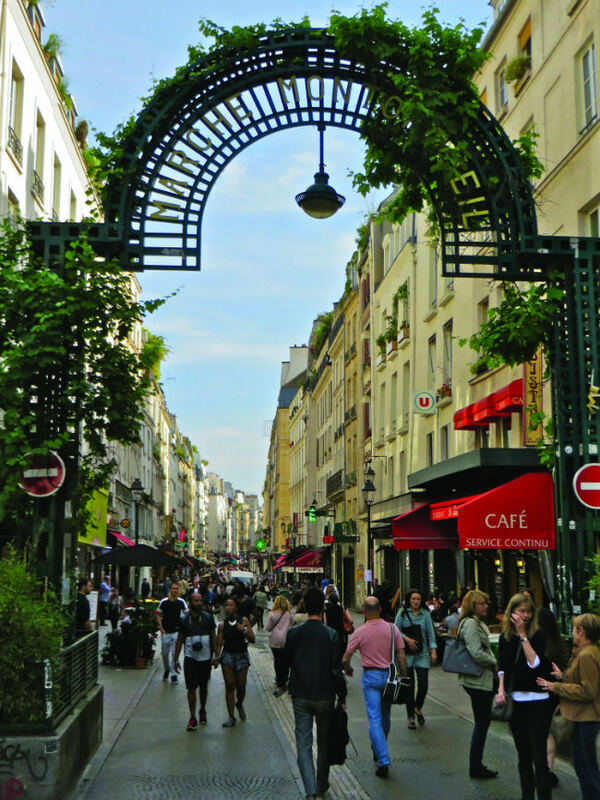 Today, there is a whole tour gastronomes and pâtisserie fans do around the neighbourhood.” They make pilgrimages to the restaurants, indulge in desserts, buy recipes at the Librairie Gourmande (92-96 rue Montmartre), stock up on cooking utensils at A. Simon (48 rue Montmartre) and quality ingredients at G. Detou. Yet equally toothsome is Montorgueil’s history. Stop at La Grille Montorgueil (50 rue Montorgueil), where Jean Gabin’s 1937 Gueule d’Amour was filmed. During the Second World War, the pewter bar was hidden upstairs to prevent the Germans from melting it down for bullets. Visit the Passage de la Reine-de-Hongrie (17 rue Montorgueil), named for Julie ‘Queen of Hungary’ Bêcheur, a simple merchant of Les Halles who let a compliment that she resembled Marie-Antoinette’s mother go so to her head that she lost it – she was guillotined for sympathising with the monarchy. Seek out the crescent moon above the door at 9 rue Montorgueil, all that remains of the 18th-century Cabaret du Croissant, which Giacomo Casanova frequented when he lived here in 1759. Balzac once said, “The streets of Paris possess human qualities and we cannot shake off the impressions they make upon our minds.” Rue Montorgueil’s quality is indeed its enduring capacity to leave all who visit with the most delicious impression: that of rediscovering Paris. 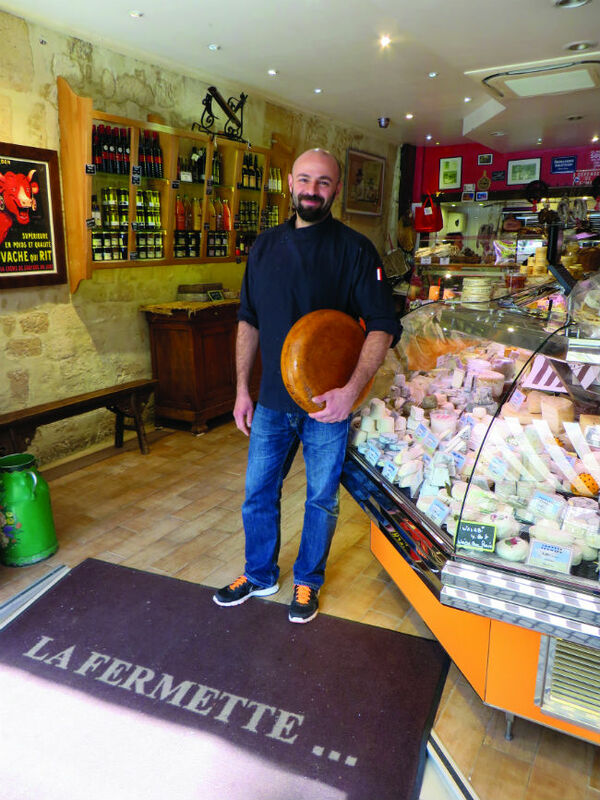 For more than two decades, the Rigattieri family has run this bustling cheese shop with ease and amiability. They patiently give primers to novices, and prepare tasting trays of several freshly sliced cheeses for €9. For aficionados, they offer a delectable truffled Brillat-Savarin and a 30-month-old Comté that food writer David Lebovitz called “the best cheese on the planet”. Situated in a (slightly tipping) 17th-century building with a gorgeous sculpted façade, this historic restaurant is such a lovely sight to behold – you almost prefer sitting across the street. 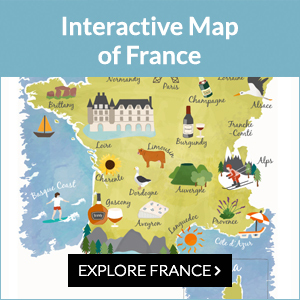 But then you couldn’t taste their exquisite Cancale oysters – direct from the Bay of Mont Saint-Michel – and raise a toast to the memory of their most famous patron, Honoré de Balzac. Founded in 1730, the oldest pastry shop in Paris is also one of the most beautiful – the creator of the 19th-century décor also painted the Paris Opéra. Naturally, the highlights are the pastries, including three versions of the Baba au rhum, which was invented here. But a plethora of petite sandwiches and savoury tarts make Stohrer perfect for composing a truly gastronomic picnic. This pioneering pastry shop was created by the passionate founders of the magazine Fou de Pâtisserie. The idea was simple, if ambitious: “We wanted to allow people to taste a selection of the best pastries in France, all in one place,” says cofounder Julie Mathieu. Discover the inventions of France’s most creative pastry chefs, from stars like Pierre Hermé to newbies like Jonathan Blot. 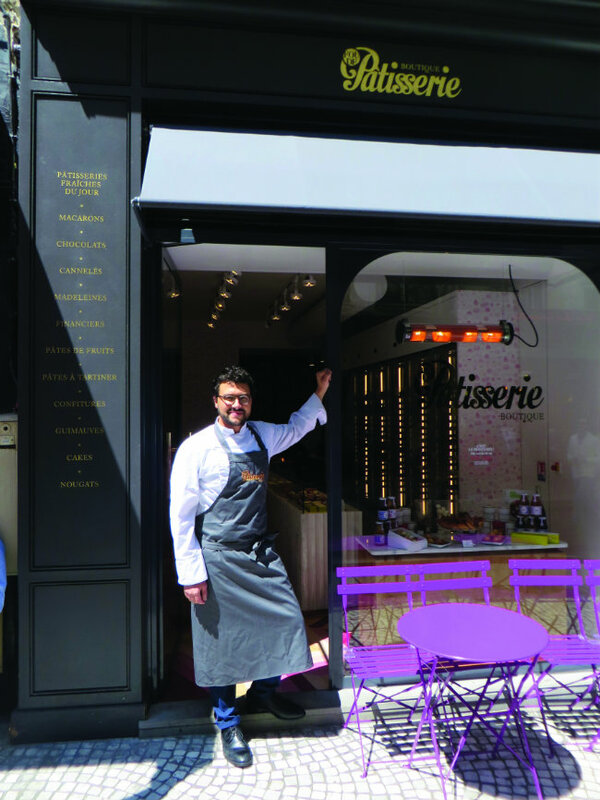 “I need to make a Paris-Brest!” a client tells manager Jean-Christophe Valy, who immediately starts piling praline, slivered almonds and other pastry ingredients onto the counter. A graduate of the elite Ferrandi School of Culinary Arts, Valy’s selection of high-end pastry ingredients, from professional baking chocolate to sugar-covered violet petals, is quite unrivalled. 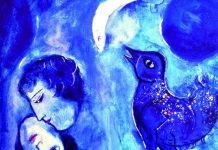 Founded in 1832, today, the iconic restaurant beloved by Proust and Picasso has at long last been rehabilitated under the ownership of Emmanuel and Véronique Laporte. 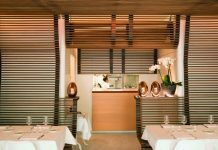 Dining on a plate of escargots dripping with garlic and parsley butter, in the splendour of the restaurant’s Sarah Bernhardt salon, is an affordable experience every sentimental gourmet should have. I must say, I am extremely disheartened to see the number of running shoes and baseball caps, and it does not look like tourists that are wearing them. Booooooo!!! I though Paris especially could be the one hold out. Take our McDoo if you must, but please, please, please leave those ugly trends to the Americans! 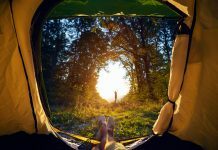 Hello nice article and I love the history and literature links. I have worked or lived in the Montorgueil area since the late… 60ies. And still is. (Does not make me sound too young.) 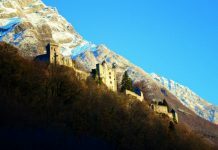 I consider it as “MY” village that I stroll and enjoy on a daily basis. 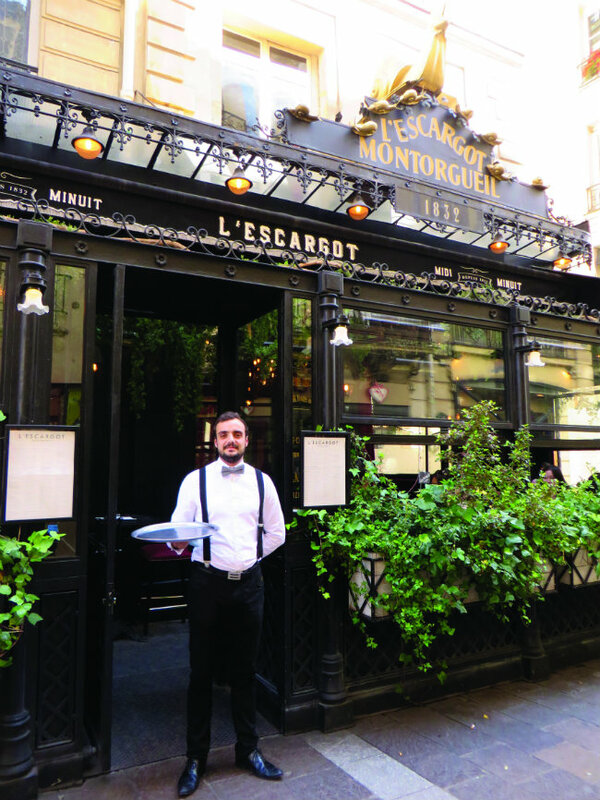 I agree with most of your addresses but the Escargot Montorgueil : the decor is still great but I never found the food great since The Terrail family sold it. It became a Tourist trap. Iwas hoping that with the renovation 2 years ago (? ), it would go back to its former quality but I have been really disappointed. Also I am surprised you do not mention great addresses in the neighborhood : A Mariages Frères tea shop ( I know it is not typical to this street but it’s very convenient) such as Terroir d’Avenir rue du Nil with high end quality vegetables, fish and sea food, butcher and bakery, a great coffee shop, and the well known Frenchie. 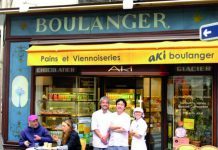 Just a few steps higher on rue d’Aboukir, a great cookie shop jean Hwang Carrant 84 rue d’Aboukir. No mention of Anais a great flower shop at corner Montorgueil/ Tiquetonne : great smiling service and flowers last long for a reasonable price. We can discuss for more if you wish to. My email address below.